Much like previous administrations, President Donald Trump’s team has filled hundreds of appointed positions with allies who can be trusted to carry out their agenda. These appointees include campaign staff, old policy hands at conservative think tanks and former lobbyists who worked on the issues their new agencies cover. A series of required public disclosures filled out by these new appointees tell us who they are. Finding more about these people, including examining their employment histories and probing for any conflicts of interest they may have, is key to ensuring that the people the president has put in positions of enormous influence and power have the best interests of the public in mind. As we did at the beginning of the Obama administration, ProPublica has published a database of who Trump has appointed to run the federal government. Here’s how we assembled it, as well as the caveats to keep in mind if you want to use the data. To be more specific, we requested lists of Trump administration political appointees at federal agencies made since Jan. 20, 2017, on a rolling basis. Eighteen agencies and the OPM, which maintains information on all political appointees, have provided employee names at different times over the past year, while three other agencies said they had no new employees to report. Several of the officials on this list have since moved to other agencies or left the federal government. In April, in partnership with The Associated Press and The New York Times, we created a shareable spreadsheet of the White House office staffers we were able to find out about. The White House released a staff list and salaries in July but has not updated that list. In many cases, we contacted Designated Agency Ethics Officials, or DAEOs, at federal agencies to determine which financial disclosures were available and which were deemed non-compliant or not releasable due to government rules. Our database includes the stated justifications from federal agencies when they have declined to release select financial disclosure records. When available, we compiled biographical information for political appointees through agency and former employer pages, LinkedIn profiles, personal websites and financial disclosure documents. We also wrote descriptions for some agencies and organizations, and wrote biographies for some staffers based on the information we collected. We did not combine entities related to appointees’ assets and liabilities. Trump campaign groups: We grouped former staffers of President Trump’s 2016 campaign, which raised roughly $500 million from donors, with other campaign-related groups. The Trump Victory Committee oversaw joint fundraising with the Republican National Committee and state parties. We also included Trump’s transition team. Conservative think tanks: Using academic research and media reports, we compiled a list of think tanks and other nonprofits that engage in policy and/or political work and matched those organizations to past employer information from employee disclosure forms. Former lobbyists: To find employees with federal lobbying records filed through the Lobbying Disclosure Act, we matched those by name using ProPublica’s Represent database, and then confirmed lobbying connections by cross-referencing public resumes and work histories. Deregulatory task force members: As part of an earlier project with The New York Times, ProPublica journalists identified members of so-called deregulatory task forces within federal agencies through FOIA requests and reporting. Staffers with ethics waivers: The Office of Government Ethics has released two sets of federal ethics waivers to the Trump executive order, in August and October. We also requested subsequent waivers from ethics attorneys at dozens of federal agencies. We grouped all of the appointees who received these waivers on one page. Special-government employees: We filed separate FOIA requests with federal agencies for their lists of special-government employees. Seven agencies have responded so far. We also grouped all of the special-government employees we have found on one page. There are limitations to this data: For one, most federal staffing data is updated through November 2017, meaning hires, departures or transfers made later could be missing. We plan to update Trump Town on a regular basis. We also have not corrected financial disclosure or staffing data from the Office of Personnel Management and federal agencies, meaning that some self-disclosed information may be inaccurate or omitted. The following organizations and journalists helped provide context, support and analysis for Trump Town: Max Stier and Erika Walter of the Partnership for Public Service; Jeff Hauser of the Center for Responsive Politics’ Revolving Door Project; Alan Zibel of Public Citizen; Gary Price of Library Journal’s infoDOCKET; Marc DaCosta of Enigma; Austin Evers and Clark Pettig of American Oversight; Operation 45’s Property of the People; Citizens for Ethics and Responsibility in Washington; Jeremy Bowers, Eric Lipton and Danielle Ivory of The New York Times and Sarah Cohen, formerly of The New York Times; The Associated Press; and Chris Zubak-Skees of the Center for Public Integrity. Jeremy Merrill and Derek Willis contributed data analysis from ProPublica’s Represent project. Alex Mierjeski and David Jeans compiled biographical information on political appointees, fact-checked our data analyses and worked on obtaining White House financial disclosures. Marina Affo, Alison Gregor, Nikhil Kuchibhotla and Leora Smith filed and catalogued Freedom of Information Act requests to federal agencies. 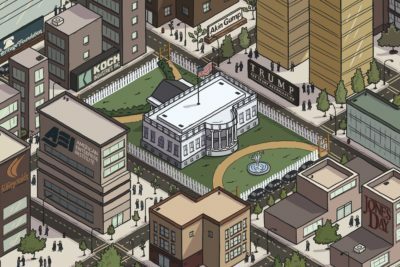 Dozens of ProPublica journalists supplied tips and guidance for Trump Town. Claire Perlman is a senior research fellow at ProPublica.